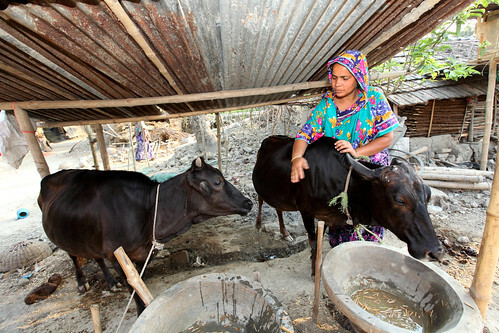 “Before the project, we had fish only once a week and meat only once a month,” says Tasbina Begum, a mother of two from Jogahati village in Jessore district, southern Bangladesh. 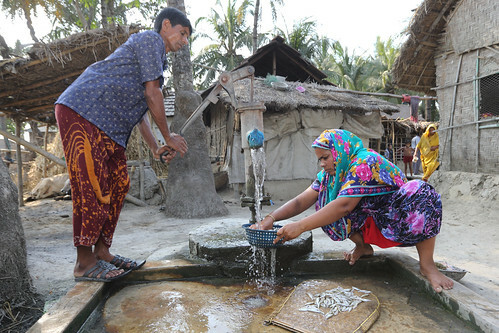 ‘Hidden hunger’, or micronutrient deficiency, is widespread throughout Bangladesh, where more than 20 million people, particularly women and children, suffer from chronic deficiencies of vitamin A, iron, and zinc. Micronutrient deficiencies cause irreversible damage in children, stunting their growth and inhibiting their brain development and cognition, making it difficult for them to learn at school and perform at work later in life. While rice is an affordable staple food for the country’s poor, it lacks the vitamins and minerals that are essential for a healthy and balanced diet. 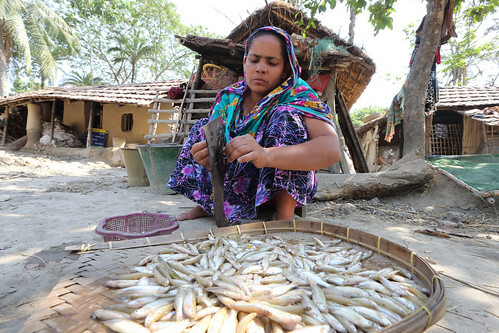 Through introducing micronutrient-rich vegetables and small indigenous fish species into the homesteads and diets of rural Bangladeshis, the Cereal Systems Initiative of South Asia in Bangladesh (CSISA-BD) is helping families to increase their income, food security and micronutrient intake. “We had three meals a day but since we had to buy everything we were only having very simple food... We couldn't afford to give good food to our children because it was difficult to maintain the basic things in life,” recalls Tasbina. Through the project, Tasbina and her husband learnt how to culture mola, an indigenous small fish species, alongside the existing major carps like rui and catla, in their household pond, allowing them to consume fish more often and sell produce at the market. “Before the project, we only ate the fish from our pond. But now, not only do we eat them but we also sell them in the market. Twice a week, we catch mola from our pond and eat them with orange sweet potatoes and their leaves, when they’re in season,” Tasbina says. Orange sweet potato is a nutritious vegetable high in vitamin A that can be grown with other vegetables around the banks of the pond, making it easy to maintain and an efficient use of space. “They taught us about the use of orange sweet potato leaves as food and explained how nutritious it is for our body. 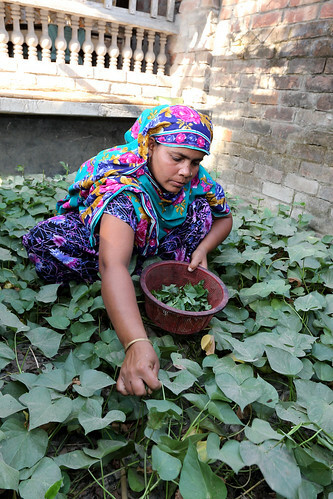 I cook them with mola as curries or eat them as vegetables,” she adds. In addition to training sessions on polyculture and farming technologies, the project also focuses on sharing information about the importance of micronutrients for pregnant and lactating women, and introducing complementary foods for infants. “I have learned that it’s necessary to eat more nutritious foods like fish and vegetables during pregnancy so the child remains healthy. Women who are breastfeeding their child should also eat lots of nutritious food as it helps them to produce more milk for the child. Now all the women know about it and they are following that,” explains Tasbina. Traditionally, infants are fed a thin porridge made from rice powder, which lacks the energy and micronutrients needed for healthy growth and development. “The women around me now know the importance of complementary foods for their infants. Some of them attended the training and some of the others learned it from us,” says Tasbina. “We have learned how we can make khichuri with rice, pumpkin, lentils and orange sweet potato. It is very nutritious for infants. Sweet potato and mola curry is also good for them,” she notes. 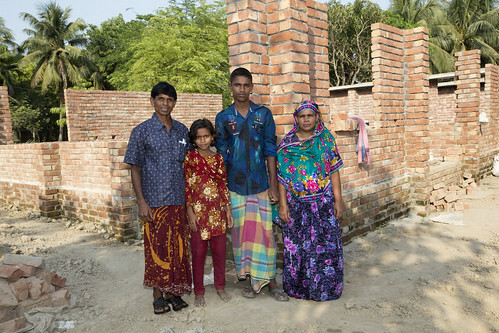 Tasbina and her husband have earned BDT21,045 ($USD271) in profit from the sales of their fish and vegetables over the last year, which has helped them to build a new brick house.